Salvation And Survival: Blessed Is The Sacrificial Lamb! Blessed Is The Sacrificial Lamb! Tonight at sundown I will begin celebrating the eight days of Passover; not as a Jew or Hebrew, but as a Christian who wishes to please God by observing His feasts as He commanded. 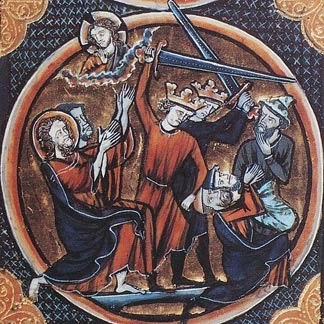 As I have dug deeper into my Bible these past few years, and as I have studied the history of the Christian Church, I have come to realize that the holiday we call Easter has no Biblical foundation, and that this holy week points to the full significance of the First Coming of our Lord. Since Easter is at the heart of Christianity, I think it is important for Christians to know the truth about how it came to be the holiest of our religious holidays. I have come to the conclusion that Scripture is my basis for truth, and not man-made doctrines, so I have searched the Bible for any mention of a holiday called Easter ... I can find none. In fact, as a particular Christian website points out, there is clearly no biblical support for Easter; but, the Scriptures actually do have much to say against Easter—both directly and indirectly. Interestingly, the Babylonian Astarte—and the Assyrian Ishtar—are referred to dozens of times in the Old Testament using the Hebrew word Ashtaroth (Ashtoreth, Asherah), typically translated as groves in the KJV. Such groves were used in idolatrous ritual celebrations. For example, “And the children of Israel did evil in the sight of the LORD, and forgot the LORD their God, and served Baalim and the Asherahs” (Judges 3:7, New King James Version). This verse could just as well be translated, “and served Baalim and Easter”! So where did this un-Biblical holiday come from? In 325 AD, Emperor Constantine, at the Nicean Council, ordered all Churches to celebrate the Resurrection of Christ on Easter Sunday. The early Church had celebrated the Resurrection during the Passover, beginning on the 14th day of the Hebrew month called Nisan, which could fall on any day of the week. But the Churches near Rome had abandoned the practice because they hated the Jews, blaming them for the death of Jesus, so they fixed the date to the first Sunday after the first full moon of Spring, which coincided with the ancient Roman celebration called ‘Easter’, after the pagan goddess of Spring, Eostre. But we must understand that professing Christians of the time were not the only ones who celebrated a festival called "Easter." Before his supposed conversion, Emperor Constantine -- like many pagans -- celebrated various pagan gods. These pagan religions often centered around moon goddesses and sun gods. "Ishtar", which is another pagan name for "Easter", was a day that commemorated the resurrection of one of their gods that they called "Tammuz", who was believed to be the only begotten son of the moon-goddess and the sun-god. So after Constantine's self-proclaimed conversion, his Empire was divided between Believers and Pagans. He saw how his newfound faith could be united with his old pagan ways to unite his Empire. 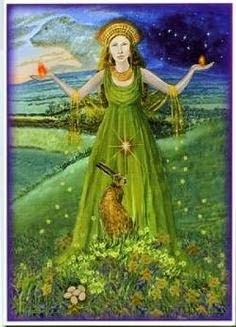 He couldn’t force pagans to believe in his new faith, but he could entice them by incorporating some familiar pagan themes, such as the goddess, Eostre, herself. He could replace the Feasts of the Lord, which were practiced by the Hebrew Believers, with familiar "sunrise" services and worship centered around the Spring Equinox. The consequences of this hostility towards the Jews has meant that nearly 2000 years after its establishment, the Church has lost the truth about God's commandments as to how we are to celebrate His Son's resurrection. But, thankfully, in this dawning of the Last Days, we have received Divine revelation, and are returning to the roots of our faith; celebrating the First Coming of our Lord, by observing His Feasts according to His calendar; the same calendar He gave to Moses. The historical account is both fascinating and spiritually inspiring. Pesach, or the day of Passover, occurs on the 14th day of the Jewish month of Nisan. On this particular day, God freed His people from slavery in the Exodus. God had heard the tormented cries of His people as they suffered the torments of slavery in Egypt, and sent Moses to deliver them. God sent a series of plagues throughout Egypt, judging them for their pagan beliefs. Nine plagues did not change the heart of Pharoah, but God gave Israel a unique way to protect themselves from the final, deadly plague; and gave Moses a new calendar that they should live by. The twelfth chapter of the book of Exodus records that a pure and perfect lamb (one without blemish) should be sacrificed, and its blood applied to the doorposts of the Hebrew homes. The Angel of Death would "pass over" all those who complied, and by the blood of the sacrificial lamb that covered the doorposts, they would be saved. The Passover sacrificial lamb was the means by which the Israelites were saved from a sure and deliberate Death. Nearly 1400 years after the Exodus, the Roman government crucified Jesus, or Yeshua, on God's commanded Feast of Passover, and He became our sacrificial Passover Lamb. By His blood, that covers us, we are saved from Death. For over a thousand years, families had selected Passover lambs on the 10th day of Nisan, and observed them for 4 days before Passover. On Nisan 10, the day they selected their lambs, Yeshua entered Jerusalem to the shouts of the multitudes, as they cried, “Hosanna to the Son of David! Blessed is he who comes in the name of the Lord! Hosanna in the highest heaven!” (Matthew 21:9). They saw Him as their conquering King of Israel; not as the Sacrificial Lamb. On the Morning of Nisan 14, which is Passover Preparation Day, Jews rushed their lambs to Jerusalem. That same morning, the High Priest Caiaphas rushed to condemn Yeshua. He was a Sadducee who denied the resurrection, and hated Jesus for teaching it. He led other Sadducees in the Sanhedrin to convict Yeshua to death. Yeshua was nailed to the cross at 9 a.m., at the time of the morning sacrifice and prayers at the Temple. That afternoon, shortly before Yeshua died, priests blew the shofar, which signaled the opening of the Temple gates when men flooded into the courtyards to slaughter their Passover lambs. As they hung their lambs on hooks with forearms spread for skinning and cleaning, Yeshua was hung in the same pose on the Cross. He died at 3 p.m., the time of the evening sacrifice and prayers. The blood of slaughtered lambs covered doorposts in ancient Egypt. That was a picture of the Messiah ... He was a lamb led to slaughter ... 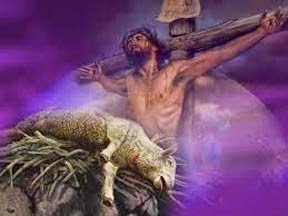 He was the Lamb of God ... He was a Lamb without blemish (free of sin) ... He is the slain Lamb on the Throne ... He is the Lamb whose blood overcomes Satan and He died for the sins of the world. Incorporated into this Passover week is the Feast of Unleavened Bread. 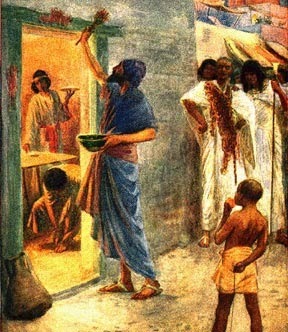 There is a two-fold significance to this day: 1) It represents the haste with which the Israelites left Egypt; they had no time to wait for bread to rise, so they were instructed to make bread for the Exodus journey without leaven. 2) Also, leaven represented sin, and God had told them to be careful to remove the leaven from their homes. Our human bodies are now the home of the Holy Spirit, and we should take great care to remove the leaven (sin) from this home. Finally, this Feast day points to the fact that Jesus is our Bread of Life, without sin. He was buried on this day, and provided a way for our sins to be buried with Him. We also find the Feast of Firstfruits celebrated during Passover week. On this feast day, the Israelites were commanded by God to celebrate the first fruits of the Spring Harvest, in thanks for God’s provision. As we celebrate, we take note that Jesus was the Firstfruit of the Harvest of Souls; the first to rise from the grave. It was on this day that He was resurrected, and we give thanks for God's provision of eternal life through faith in His Son. As you can see, through His commandments to observe His feast days, God gave us an exact picture of His plan to redeem mankind. The Feast Days of Passover week point us to the First Coming of Christ in a very specific way that a holiday named Easter -- with its pagan roots -- can never do. Just as the blood of Passover lambs in ancient Egypt covered the doorposts, the blood of the Messiah, our Passover Lamb, covers our hearts. The Israelites were delivered from slavery in Egypt on these very days, just as we are delivered from slavery to sin! And Jesus died, was buried, and resurrected on these specific days. That's why, beginning tonight at sundown, and for the next 8 days, I will be celebrating my freedom from sin's hold on me -- my victory in Yeshua -- and celebrating the hope that is my resurrection. John 4:22 "You worship what you do not know; we know what we worship, for salvation is of the Jews." Prayer, as part of a Passover Seder: Blessed are You, O Lord our God, King of the Universe, Who brings forth bread from the earth. Thank you for Yeshua, the Bread of Life, who rose from the earth. And thank you, O Lord, that by His stripes we are healed. Amen.